girlnextdoorfashion: running, food, lifestyle, lipstick: Cookbook review - Bosh! It's not often that a vegan cookbook gets genuine hype in the mainstream. I was on a book-buying ban when I first started hearing about this (doesn't this always happen? It was the same thing with The Roasting Tin last year which ended up being my cookbook of the year). My friend Sophie had made a few recipes from it and posted about them on Instagram and told me I'd love the book, and then it was the book of May at Cookbookamonth. I don't watch videos online much, so I'd never heard of the "Bosh boys", but I started to noticed their names popping up more and more, and hearing about the popularity of this book and their recipes. So, one day after work, after finding out it was on offer in Waterstones, I caved. This book gives a brilliant first impression. It makes vegan food so accessible and easy and importantly, fun. While I have no problem ordering nutritional yeast or vital wheat gluten online, I like that it doesn't include a lot of "obscure" ingredients which can put people off, and instead focuses on plants, pulses, nuts and the occasional bit of tofu. I don't think if this is the intention or how it's marketed, but I feel as though it's a book for meat-eaters intrigued to try vegan food. It makes everything seem quite easy and it's not preachy at all about the benefits of vegan food of a vegan diet. It also, thankfully, doesn't preach a "clean" agenda, but there are a few comments about "healthy" (which I personally dislike only because it's so subjective). However one recipe shout about how it's "healthier" than a takeaway, yet includes half a bottle of sweet chilli sauce. BUT I would rather it be this way - desserts and chocolate and pizza and burgers - with no "healthy" or "clean" agenda. From an initial flick through there are a lot of the standard fayre you expect from a vegan book - a veggie chilli, curries, tofu scramble, stir fry, salads, veggie burgers, lasagne - but there are a lot of interesting twists on these recipes (more on this below). Finally, if you haven't been able to tell from the exclamation mark in the title, the language is a bit Jamie-Oliver-circa-2004/Joe Wicks in terms of over-the-top enthusiasm. I've learned to ignore it because it's pretty grating but you do get used to it. I tried 7 recipes from this book. I usually like to try 10, but I ran out of time with going on holiday. However there are still loads of recipes I want to try, so maybe I'll do an update in a few months. It's also not helped that it's been roasting while I've been using this book, so Mushroom Wellington and Rich and Creamy Lasagne were not the kinds of things I wanted to be eating! I still have about another 20 recipes I was intrigued by. edit: As I've mentioned in previous posts, I haven't been as active on Instagram over the past few months, so as a result I don't have photos on all the recipes I made. Apologies for that. I shop at Aldi so I couldn't get shiitake mushrooms, so I just used portabellos, but next time I'd probably use regular mushrooms, as Phil later dropped the bombshell that he doesn't like "big mushrooms". 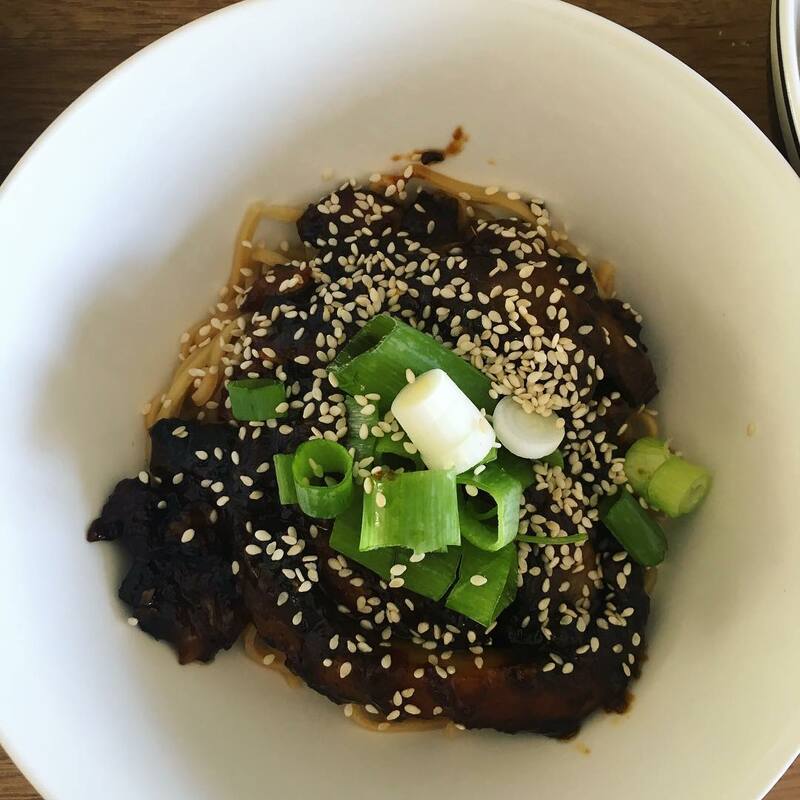 This was super quick and easy and so so delicious that I kept saying "do you like it? Do you like it? I love it - what do you think?". Also a great storecupboard recipe - all I needed was the mushrooms. I found the instructions here didn't make loads of sense (covering the veg in the sauce first then threading sounded messy to me), so I threaded them first then poured the marinade over them, but oh my god the marinade. There are a lot of ingredients in this (18! ), but they all get thrown into a blender and whizzed up to make the most divine spicy, yoghurt-y sauce (oh confession, I used regular greek yoghurt). This made A LOT. I used a few fewer tomatoes and still ended up with 13 skewers. I was eating this for days, which was fine. I really liked that you baked them, so you can have a BBQ without actually owning a BBQ (something we do at least once a fortnight and still call it BBQ cause there are things on sticks). OH MY GOD THIS WAS SO SO SO GOOD. Okay it was a bit of a faff. Roasting the veg, toasting seeds, frying things off and then blending them up (you definitely need a blender for this book), and it takes about an hour, but oh my god so good! I added chickpeas for some extra protein, and got 5 portions. Some of the serving sizes are a range (eg. 2-4) in this book which can be confusing, but saying that a lot of my books suggest child-sized portions so it was quite nice to not feel judged if your portions were towards the lower end of the number of people it suggests. This was just amazing. The lime and salt really help cut through that creaminess and I would definitely make this again and experiment with different vegetables or pulses in the sauce. We love tofu in our house and I'm always trying to find new and exciting ways to cook it. 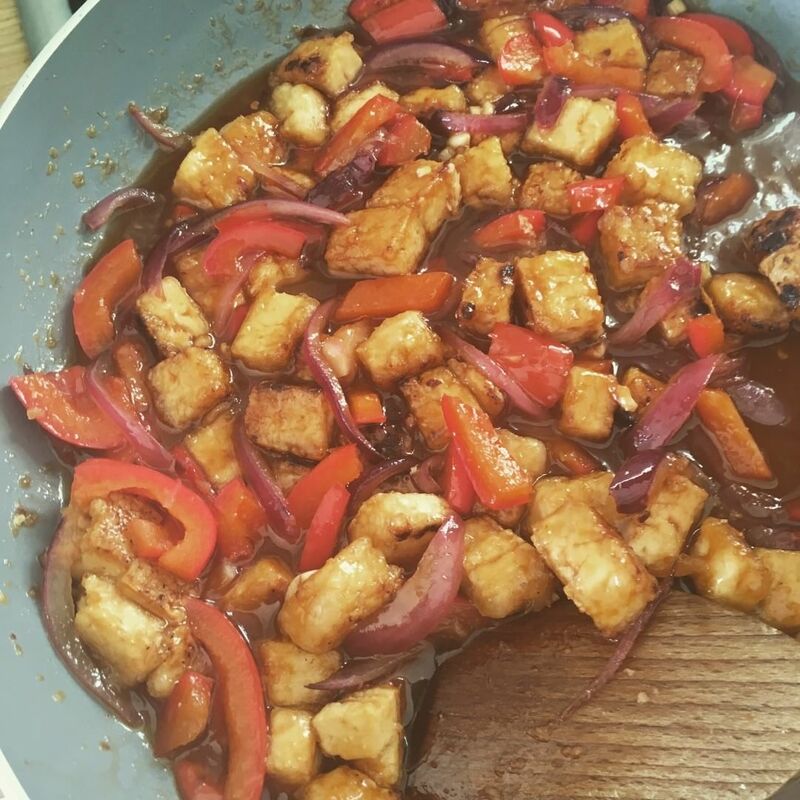 Sweet and sour prawns used to be my takeaway staple (I do still eat fish but very rarely these days), so I was really excited to make a vegan version. It was quite hands-on and intense - if you've ever done a Jamie Oliver 15 Minute Meal you'll know what I mean. However I was making rice, cauliflower rice and warming spring rolls at the same time. It took about half an hour in total. Bloody hell this was good. It tasted EXACTLY like my favourite takeaway prawns - so sweet and sticky and tangy - and the texture on the tofu was so crispy on the outside - exactly how I like it. I think this would be a great gateway for people who want to try tofu but don't know where to start. One thing I like about this book is it makes the idea of making your own curry pastes much less intimidating. The paste here is a blend of chillies, garlic, ginger, tomato puree and water, but along with the spice mix, both tastes and smells exactly like a jarred curry paste. 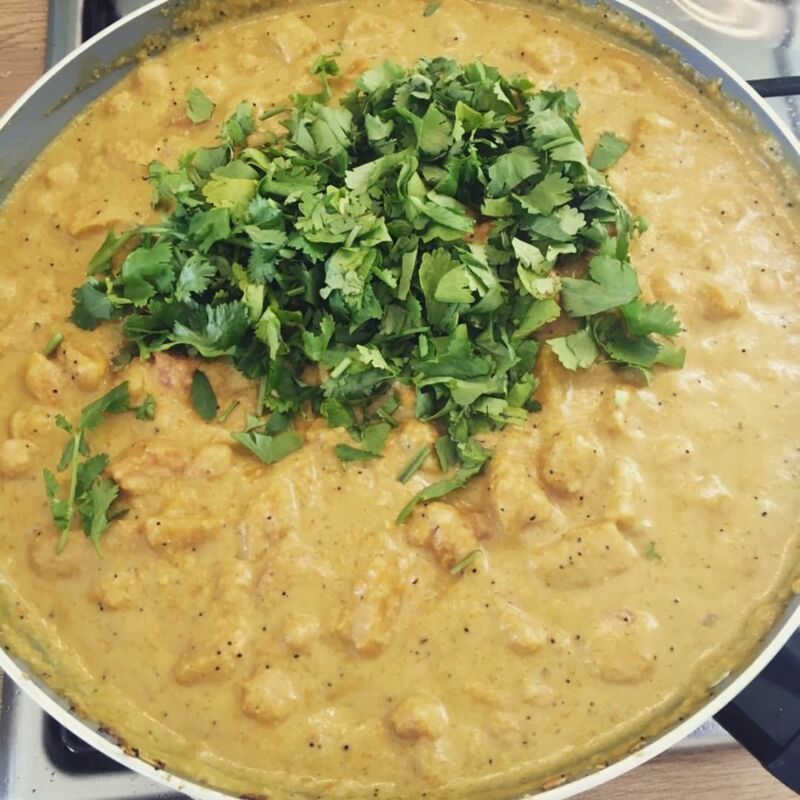 Like making a curry from a jarred paste, this is a really easy recipe once you've completed those initial steps. It's another 15-minute-meal-esque speedy rampage, which meant I did misread a few steps and found myself confused at why I was frying the aubergine first when it wasn't going into the pan til the onions had cooked for 15 minutes. The sauce is quite dry, and it encourages you to add as much water as you need to get it to a "thick, gravy-like consistency", but my addition of spinach, and the water it needed to get it to wilt, along with the water it releases, ended up making the finished dish a little watery. Next time I would consider cooking the spinach separately or adding it in earlier, as it was a nice addition. Considering the easy of the curry paste here, I'm really keen to give this another go with different vegetables, maybe with some tinned tomatoes for a more curry-like texture, but the flavours are completely spot on. As mentioned earlier, I decided to give the veggie kebabs another go with a different marinade, and settled for the Asian BBQ marinade, which was a mix of chillies, garlic, coriander, ginger, agave syrup, vinegar and soy sauce. I didn't agave syrup (though maple would, I'm sure, have been a fine substitute), so being a non-vegan I used honey. Having already done the spicy shashlik marinade, I knew what I was doing a bit more here, so I used a lot less veg (eschewing the aubergine which had remained a bit spongey last time) and brushing the marinade on. This was really, really good and I loved how easy to was to make what felt like a completely different dish from just a different marinade. I'm keen to try the rich satay sauce next and really feel as though my summer BBQ game has been upped thanks to these kebabs! On my original list of "recipes I want to cook from this book", this didn't make the cut. 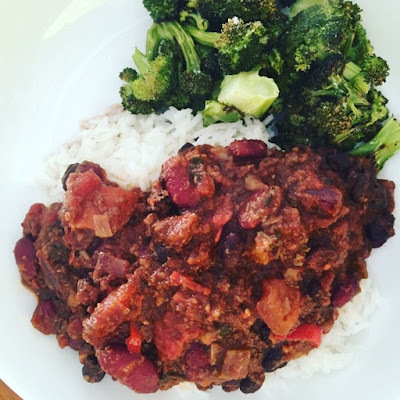 I make vegetarian chilli at least once a month, maybe even once a fortnight, and I have a few favourite go-to recipes - Cookie and Kate's Butternut Squash chilli from Love Real Food and the Super-thick Three Bean Chilli from Minimalist Baker. Both of these are delicious, made of storecupboard ingredients and can be made in the slow cooker or in my Instant Pot. So I'm not sure what made me revisit this, but upon another look I was intrigued by the unusual ingredients list - red wine and chocolate are fairly common in chilli, but also maple syrup, soy sauce and cinnamon? I was curious. Another thing I loved was the idea of making "mushroom mince". This isn't a new idea - I've seen Jack Monroe do it months ago, but I'd never done it myself. Like my previous comment, the order of instructions was odd - mincing the mushrooms is the first step although you don't add them til the last 10 minutes, although doing them first does mean you only need one pan (edit: The recipe does say you need two pans though so maybe not?). Anyway, this was super super super delicious. For a house that eats veggie chilli often, Phil declared this his favourite chilli, and I really loved it too. The only downside, for me, is with the red wine needing to be cooked off, it's not really an option for the slow cooker (however I wonder if I could make it in my Instant Pot? One to look into), and it's a good 45 minutes from start to finish, and even then I would have preferred a longer simmer. In conclusion, I absolutely loved this book. There are still loads of things I haven't gotten around to making yet - giant burrito cake, Thai red curry paste, homemade naan, onion fried rice, vegan sticky toffee pudding, hash browns, so I know this is a book I'll keep going back to. 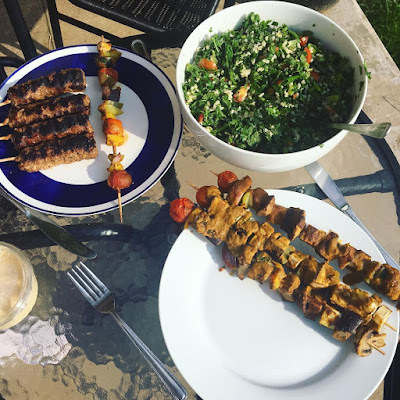 For me, the sweet and sour tofu and korma recipes were as close as I've ever tasted to takeaway and a complete revelation, and the marinades for the skewers were so simple, but have really given me great ideas for my next BBQ. I think this is the perfect introduction to vegan food for those transitioning into eating less meat, or curious carnivores. It makes vegan food fun and exciting and interesting, and not just salads and meat substitutes (although I do love both of these things!). It's vegan without too much of a health agenda, and it's not preachy or judgemental. I love the emphasis at the start of the book on how well-tested all the recipes are, and there's a great section about learning to cook and how to continuously improve which is really inspiring and helpful. The whole thing is very positive and inspirational, without being unattainable, and I really like how easy and accessible they make vegan cooking - they talk about opportunities to try new things and develop new skills, not about anything being missing from their lives without meat or dairy. I'm excited to see more from Henry and Ian and I'm sure another Bosh book won't be far away, and if it's a good as this one, I'll be sure to buy it!